You are here: Home / Compresssion Stockings / Compression Socks / Can Compression Stockings Help with Shin Splints? Shin splints is the term commonly used to describe a more or less extreme pain and tenderness in an area of the shin from just above the ankle and extending approximately up to the middle of the shin bone. The actual medical term for this condition is periostitis. It is an irritation (inflammation) of the tibia, which is the casing (sheath) around the bone tissue. Shin splints are often seen in athletes e.g. runners or team sports that require lots of running and repetitive motion such as basketball, soccer or cycling to name a few. Shin splints are basically caused by abusing and over using the calf muscles that are attached to the shin bones and not allowing sufficient time for the strained calf muscle tissue to recover and heal. This results in the calf muscles becoming inflamed from the constant flexion, which in turn can cause intense muscle pain. Other common reasons for shin splints can be sudden changes in an individual’s level of exercise such as a new sports activity, more frequent, faster and longer walking or running. Flat feet are also known to cause shin splints and increased stress on the lower part of the legs. 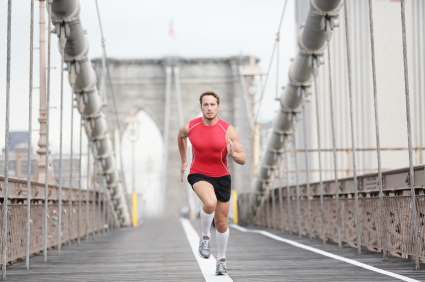 How can Compression Stockings help with Shin Splints? Compression stockings for shin splints are available as a compression sock or footless compression sleeve to provide extra support for the aching and throbbing calf muscles. These specially designed compression garments often feature wide ribbing on the front for targeted support of the shin and a tighter ribbing weave on the back side to support the calf muscles (this can be especially beneficial for hard and extensive runs). Cutting-edge models of compression socks or sleeves (e.g. CEP, Eurosocks, and Zensah) also incorporate silver ions in their fabrics which are said to help regulate body temperature and fight bacteria. Calf and Shin supporting compression socks or compression sleeves are frequently worn by athletes to enhance their endurance, to shorten recovery time and provide extra protection for their shin and muscles. The built in graduated compression in these “Power Socks” helps to optimize blood circulation in the legs, which in turn delivers more oxygen to the muscles allowing the athlete to push their performance to new heights. Graduated compression sleeves or socks are ideal for endurance sport enthusiasts and athletes alike who suffer from shin splints. Other commonly applied remedies that can be helpful with shin splints are rest, ice packs and wearing the proper shoes. Do Compression Sleeves work for Shin Splints? Many thanks for sharing! I will definitely be back. This is the kind of info that’s needed and not the random misinformation that’s at some other blogs. Appreciate your sharing this great doc. Hey there I am so grateful I found your blog. I would just like to say many thanks for a marvelous post and this all round great blog (I also love the theme/design). I don’t have time to go through it all now but I have saved it and also added in your RSS feeds, so when I have time I will be back to read more. Please keep up the excellent job. You always know how to find the right topic to write about. An attention-grabbing blog post is worth a comment. Cheers. Thank you for all of your effort on this site! This was extremely useful for me. Massive thumbs up for this site! Congratulations on having one of the most sophisticated blogs I’ve come across in some time! Its just incredible how much you can take away from something. You’ve put together a great blog space –great graphics, videos, layout. This is definitely a must-see blog! These are the products you will love to wear on your feet. I was searching for this. Thank you very much. I loved reading this blog very much. It is good to see that you are making a real difference to peoples lives. Looking ahead to additional contributions, thanks again. I appreciate you taking the time to create this post. It has been really valuable to me certainly. I appreciate you sharing this information here. Thanks! Thanks for your posts, please keep doing it. It was a pleasure to read your site. Great article, I had no problems printing this page either. Another great article. Good luck to the author! All the best! This stuff is extraordinary thanks for sharing. The number of blogs on the internet is increasing and among so many is your blog, which I found to be very useful.